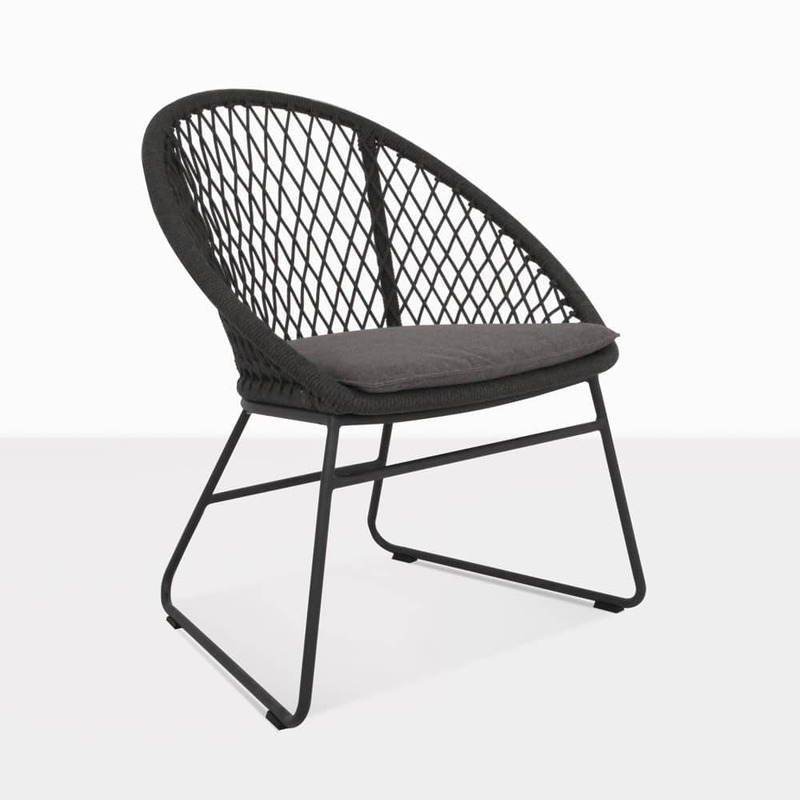 Create a cutting edge outdoor dining set with the Zaha Woven Rope Dining Chair in stunning charcoal grey. The design is eye-catching and contemporary with extraordinary attention to detail. 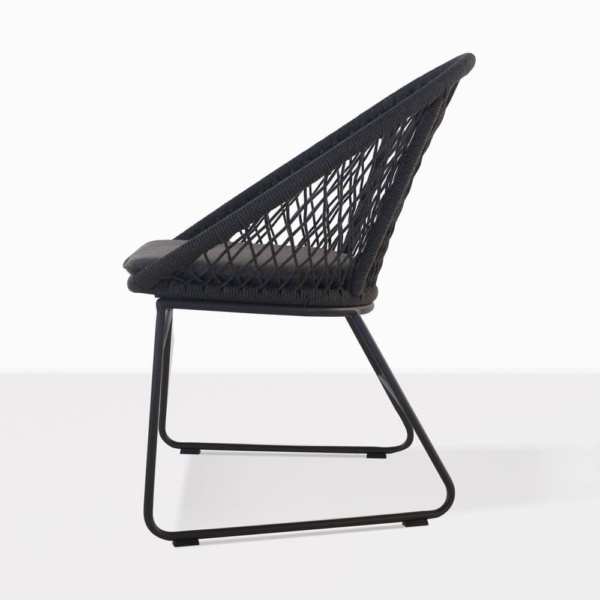 The powder-coated frame is expertly wrapped with high tech rope in a stunning cross weave pattern. The seat includes a Sunbrella® cushion to ensure comfort for long dinners with friends that last into the late evening. Pair this chair with many of our outdoor dining tables including concrete or teak. Create the set that will work for your space, only at Design Warehouse. Call us or visit us to order the Zaha Dining Chair. 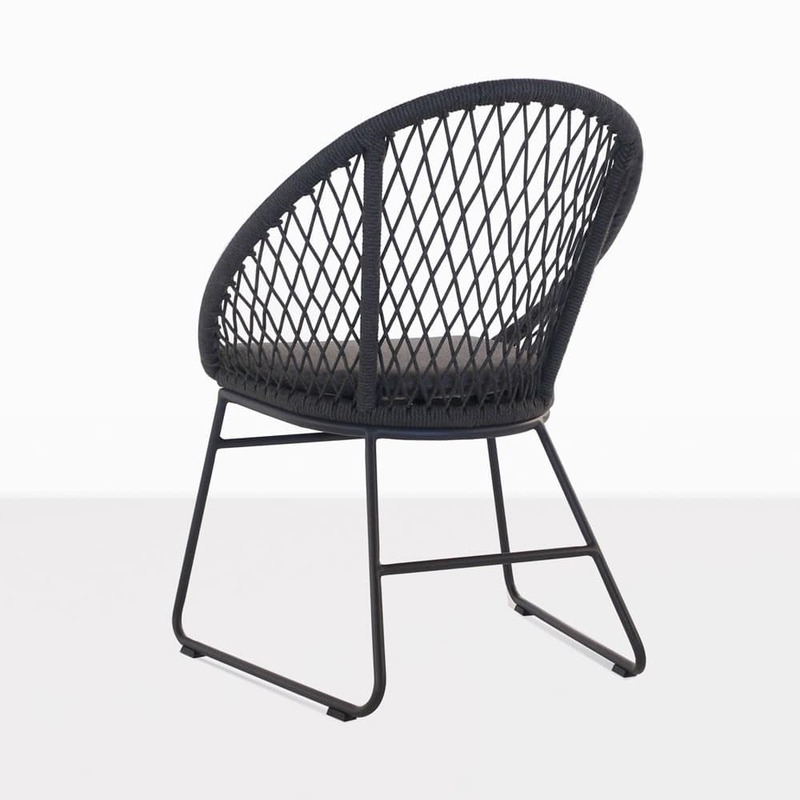 A resplendent mix of modern style and traditional principles, the Zaha Dining Chair from Design Warehouse will suit your outdoor area and keep you in comfort and style! A mid century style, with a rounded back and sleigh legs, gives way to contemporary materials that make the Zaha Dining Chair light and airy – suitable for minimalist looks, or softening a chunky, rustic setting! Place this divine Zaha Outdoor Dining Chair around a solid concrete table for an attractive urban look – dress with cantilever umbrellas and concrete pots and call forth your friends and family for outdoor entertaining in modern elegance! A series of these beautiful Zaha Chairs around a round teak table will lift a traditional look to a more present day one, while being dashing, simple and attractive. Zaha can also be used indoors! Freshen up a kitchen dining area, or use in the office for a point of difference in your home! The powder coated aluminium frame is sleek and chic, but is also a strong material that lasts. 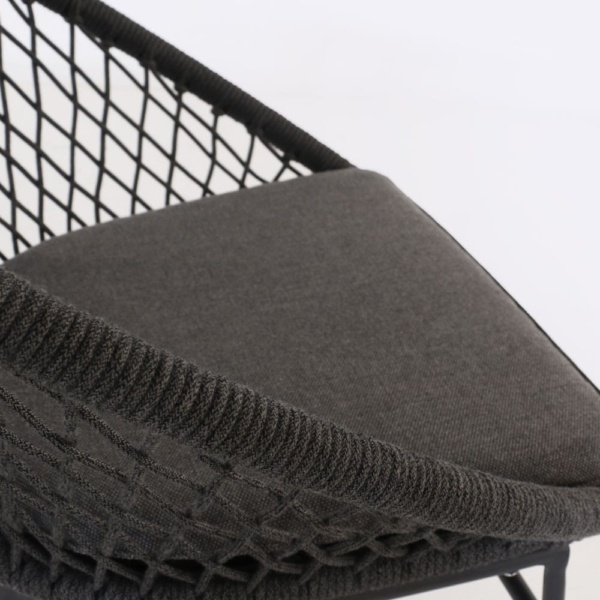 Wrapped over the seat and back is a special through dyed and UV treated synthetic wicker, which is not only comfortable but exceptionally robust! With this charming chair comes a free Sunbrella® cushion filled with QuickDry® foam, giving you additional relief, luxury and wellbeing! Design Warehouse is proud of the outstanding range of all weather outdoor furniture that surpasses expectations with style and quality second to none! View our range of dining furniture, deep seating, umbrellas, accessories and lounge furniture and change the way you live outdoors! The Zaha range also features a relaxing chair so you can make a connected, clean, cool look that you will adore! Call us today to order your Zaha Dining Chair and transform your space!